Place sun-dried tomatoes in a two-cup measuring cup and cover with boiling water. Let set for 30 minutes or so. Heat oven to 400. Wash potatoes and put on a cutting board. Place chopsticks on either side of the potatoes and then cut thin slices down the length of the potato, almost all the way through. The chopsticks should prevent you from slicing all the way through. Rinse the potatoes again, making sure to get in the cracks. Pat dry. Drizzle about a tablespoon of olive oil in the bottom of a roasting pan. Rub another half tablespoon or so on each potato, forcing some oil into the slices. Roast the potatoes until tender, about 45 minutes. While the potatoes are cooking, drain the tomatoes and dice them. When potatoes are done, push the tomatoes into the top of each potato. Top with cheese and bread crumbs and salt and pepper to taste. Return to oven to melt cheese. Garnish with fresh basil when done. Serve hot. This entry was posted in Dinner, Food, Recipes, Sides and tagged baking, potatoes, side dishes, simple recipes, vegetables. Bookmark the permalink. I keep seeing recipes for these potatoes. So wonderful looking all fanned out….one day…until then I will enjoy looking at yours. I’m making these for New Year’s Eve except with parm. Your version looks delicious! 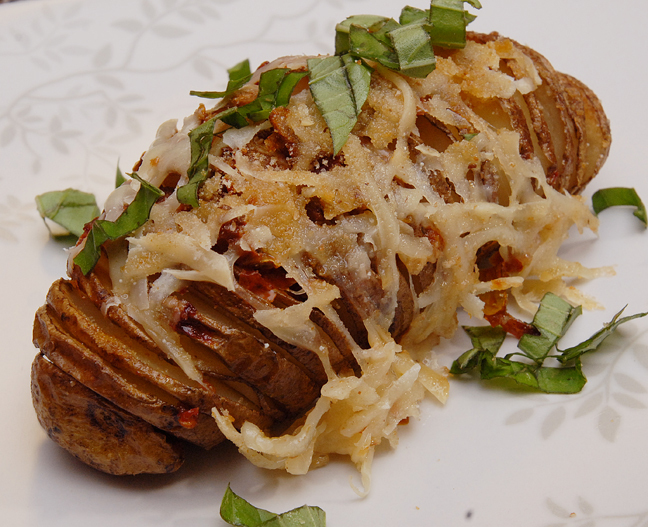 We love making Hasselback potatoes! Your variation looks & sound delicious! Happy New Years! You have been inspiring me for a long time to try making hasselback potatoes. I’ve got to make a move! Yum! I love the sundried tomato-goat cheese combination! 🙂 Happy New Year! Throw in a soft poached egg and this makes a beautiful brunch dish. Happy new year to you both. But we had poached eggs yesterday! Oh wait, that’s a silly thing to say. Grand idea Eva! The presentation is really cool and I bet these taste as good as they look! These potatoes are such show stoppers. I’m actually making a recipe similar to these tomorrow. It was printed by a restaurant in 2013. I thought they were kind of a new thing. Wrong! I’m sure happy to have another version though. My hubby loves sun dried tomatoes! I love finding stuff that’s new to me but been around forever. I don’t mind being late to a party! Have a great New Year’s Eve! Me too! Happy New Year to you too!